South America, North America, the Caspian and Africa all had their shady oil enterprises revealed in this remarkable documentary series for BBC. 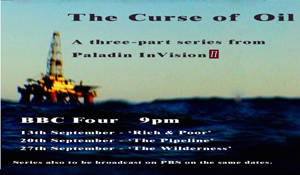 Archive was required to provide further insights to the investigative journalism originated by Paladin, revealing the political dangers faced by populations where the power of oil reigns. Footage was sourced from throughout the Middle East, Africa, South America, Georgia, Russia and Turkey, as well as from the UK and USA.